Retail stores and brands have been closing left and right in the past 5 years. In the last year, a store closure headline or walking by a "Last Chance, going out of business " sign is nothing new. I actually had no idea that L Brands based out of Ohio owned Henri Bendel. They purchased the brand back in 1985 (NYTimes Archives, 1985). 5th Ave has created a name for itself in New York. 5th Avenue lies in the Upper East Side of Manhattan, outlining Central Park. Real estate at minimum is for the 6 figures salary holders. The price tags in a majority of the stores along this prestigous strip of land do not come cheap either. Shopping in the area includes Bendel’s of course, Bergdorfs, Harry Winston, Van Cleef & Arpels, Cartier, Louis Vuitton, the list goes on and on. Henri Bendel is known for their accessories, primarily handbags, and jewelry. The brown and white stripes are forever the stores legacy. A Little History: The original Henri was from Louisiana, and made his way over to New York in 1895. It did not take long for his own shop to have a reputation for being a brilliant leading tastemaker and holding clientele of Manhattan’s elite. Luxurious was the only word to describe his work. He branded himself with the brown and white striped bags as well as matching hat boxes, the trademarked design sticks to this day! He went on to start carrying basically everything a woman needed in his shop. As for his clothes, he carried his own designs along with top Paris couture. Geraldine Stutz an ex-fashion magazine editor joined the team as President and brought to them the creation of street shops. I walked in on January 15th, just 2 days before the flagship closed it’s doors for good for forever on January 17th at 5:00 pm. Only the first level was open with merchandise for sale, the upstairs and monogram shop was closed up. 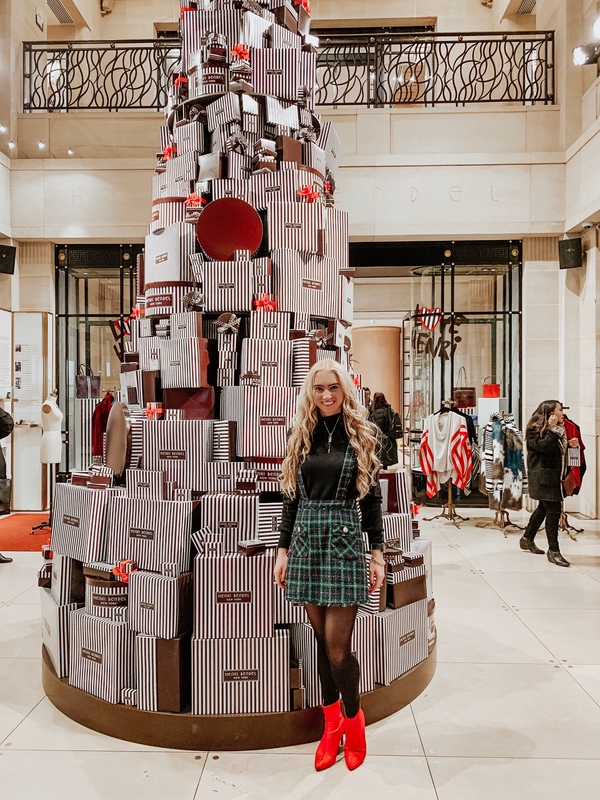 During this time the website was still open to shopping, but it was pretty much cleared of inventory aside from a few bags, charms, and some candles that did not have the Henri Bendel logo on them. All I wanted was the Jetsetter Backpack, but it was sold out online, and there were none left in store! Walking amongst the sales floor it was very apparent as to what SKUs were not productive as a handful of the same purple bag, furry bag straps, and beachy accessories were the only things left in larger quantities. It was somber to see the store so empty, but at least it was not covered in last chance bright yellow signs as most liquidations have. They just had their normal branded signage up with 50% off. What is your first memory of Henri Bendel? Comment below! Mine was visiting the Mall of America location in Minneapolis, and later on in college, hosting a Fashion & Business event there. I thought it was amazing that we got goodie bags of a free keychain and bracelet at the event. (Gossip Girl was still one of my favorite shows at the time and Bendel’s was one of Blair’s go-to stores).